The Tesco bosses must have been scouring the market for something new that they can ‘own-brand’. Baked beans: Check. Been doing that one for years. Thinking more outside the box, how about, err, a tablet? That’s right, Britian’s leading supermarket chain is apparently pondering entering the tablet market by creating their very own tablet. This story would be easily dismissed ordinarily. When claims are being made around an Apple ‘ambush’ and a tablet that will provide the armory needed to ‘fights to win back shoppers in its British heartland’ than my first inclination is to laugh. Surely such a scheme, even if superbly executed with a great Apple beating product, surely this would be nothing short of a gimmick? If you’re losing your core market to other supermarkets, surely you should start by addressing the groceries section. That is after all, excuse the pun, their break and butter? However the story has been reported by the Times no less, and the fact that Tesco are looking to use such a device as a tool to further promote owned services like Blinkbox add some more credibility to the idea. 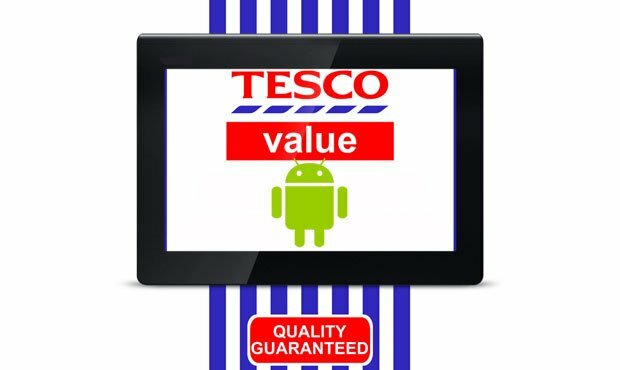 Tesco, its alleged, see an opportunity to use a tablet as a tool that could conjoin some of their core offerings. A cheap tablet could give more exposure to Blinkbox, and also to native Tesco grocery, banking and insurance based products. By pre-loading the device with Tesco apps, the company believe that they can cajole Britain’s shoppers to sue more of their services. By targeting older-customers, they believe that they can tap into more of this valuable demographics disposable income. They also believe that people in this segment generally aren’t aware of Tesco’s products, especially services around home-delivery. Its thought that sticking an app on their new tablets home screen is a surefire way to get more take-up of these services. Whilst a lot of the above is true, the real problem lies in creating a tablet that people would actually want to buy. The cheaper end of the tablet market is increasingly hotting up, with a number of solid offerings now in the market. Add in the frenzy of pre-Christmas releases, and any Tesco offering is likely to get buried. The indication is that Tesco are looking to match the kind of spec found on the Amazon Kindle Fire, which is a tablet that sells for £129. In order to make an impact, Tesco would be obliged to undercut that price markedly. However, no indication was given for an expected Tesco tablet RRP at the time of writing. If Tesco are serious about making an impact, then an aggressive price point is a must. They’re looking to make back the money that they have lost from being out-competed by Amazon and Apple in the books and movies space. Formerly a valuable segment for Tesco, they’ve witnessed years of erosion to the point that the sector is currently not valuable for them. Before we expect a massive undercutting on the Kindle Fire though, lets remember that Amazon already subsidise that device because it generates so much revenue from book and other product sales for Amazon. What do you think, could you be seen with a Tesco Tablet? Let us know in the comments below!